In my last post I mentioned that I've been doing a lot of reading about food and nutrition. I have some issues with my health that haven't been rectified by following the current nutritional philosophy. It doesn't help that that philosophy changes about as frequently (or more so) than most people change their decor. Something had to give. Given the fact that so many diseases have popped up and increased in direct relation to "new" processed foods, I figured that real foods that have stood the test of time have probably done so for a reason. I've been on a journey to find out all that I can about it. Thank God, I've got a great doctor who is on board with taking care of problems as naturally as possible. She even recommended a book for me on the subject. So, I thought I'd share some of the resources that have been really helpful to me. The common bond between all the following is that they focus on eliminating processed foods and getting back to eating "real" food. 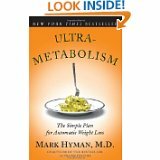 "Ultra-Metabolism" by Mark Hyman, M.D. - This is the book that my doctor recommended. It talks about how our bodies process food, which foods to steer clear of and it has a systematic approach broken down into weeks to help jump start the health process. It also has a recipe section in the back. 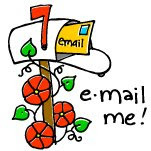 Dr. Hyman also has a weekly newsletter that I receive. You can sign up for it on his website. 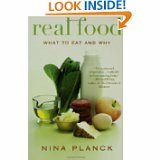 "Real Food - What to eat and Why" by Nina Planck - Hands down, the best of the best in my opinion. I would file this under "Must Read" for every person even remotely considering eating healthier. This is the book I wish I would have started with. It's full of so much information, but presented in way that isn't overwhelming at all. Nina has an easy style to read, while giving you lots of meat to chew on. 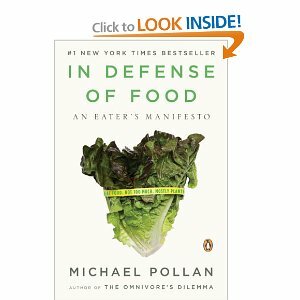 "In Defense of Food - An Eater's Manifesto" by Michael Pollan - This is an excellent resource. It gets into the history of our food, which is much more important than I realized. It's definitely an eye-opener to find out who is really controlling our food supply and heart-wrenching to find out that the people that are supposed to be looking out for our health aren't. But, this isn't a depressing book. It gives steps we can take and leaves us full of hope in spite of the system. 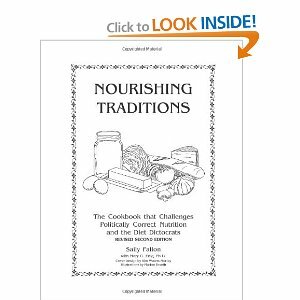 "Nourishing Traditions" by Sally Fallon - Ok, to be honest, this book is really heady. I had to really be able to sit down with highlighter and concentrate in order to absorb this book. But...it's is absolutely full of studies, pictures and helpful information. And, that's just a bonus to the fact that this is a cookbook. I keep coming back to it for ideas on how to eat better - especially with ingredients I'm just getting familiar with. There are many, many helpful books on the subject. Some I have read. Some are still on my list to tackle. But, these are a handful that have really impacted me. I also get a daily newsletter from Dr. Mercola. He deals with everything from food to vitamins to water filtration and what we should be sleeping on. He often offers products that go with what he talks about, but not in a pushy way. He can be rather long-winded, but it's always worth at least skimming through the article. I've gleaned a lot of great information from his newsletters. 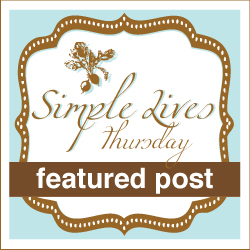 Another great resource for me has been blogs. There are many great real food bloggers out there. These are the ones I read on a daily basis. Sometimes I get good info. Sometimes I get great recipes and how to's. And sometimes I get much needed encouragement to keep on keeping on. GNOWFGLINS - Enjoying "God's Natural, Organic, Whole Foods, Grown Locally, In Season"
One more thing I'll leave with you is a documentary that rocked our family called Food Inc. Rent it from the library. Watch it on Netflix. Just watch it. That's all I'm going to say about it. :0) Don't you just hate that? I realize that each person's body make-up is slightly different and that there isn't a one size fits all diet. I also understand that we should prayerfully seek the steps that we need to personally take toward health. But, there are certain truths that hold true for all of us. These resources aren't the end all and be all to health and nutrition. Your optimal diet will probably look a little different from mine. Heck, my diet is constantly changing, as I think it should. I know that my family has a long way to go. But, I plan on continuing to learn more, seek God's wisdom and baby step mine and my family's way to better health. With these resources, as with everything in life, I think it's good to keep an open mind to the facts presented, weigh them, pray about them, digest the meat and spit out what you need to. I've personally found that I was overwhelmed by some things earlier on that I can handle at this point in life. My husband wants to give Food, Inc. as a Chrsitmas gift. It was eye-opening, well thought out, and produced. My kids watched it with us (rated PG, YAY!) and it opened both of their eyes as well. This is a great post of resources. I am with you on this issue. Thanks for all these resources, Pam! I love to read, so I'll be checking some of the books out. And my major reason for all the cooking I do is to try to feed my family is naturally and healthfully as possible.